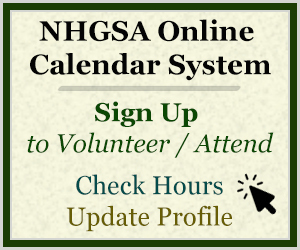 We are looking for a few GSA volunteers to help out at the NH Tourism Industry’s annual gathering, which includes educational workshops and seminars, a product and service expo, keynote speaker, updates from the Division of Travel and Tourism Development, and the Annual Meeting of the NH Travel Council. Check out the schedule for details. If you are interested in volunteering, and your name is on the list to the right, you may sign up when the calendars open on May 2. Monday, May 14: 7:30 a.m. – 7 p.m.
Tuesday, May 15: 7:30 a.m. – 2:30 p.m. The Conference will take place at various locations around Concord. Monday: the day starts at the Capitol Center for the Arts Concord (map), with various events throughout the day held at the League of NH Craftsmen, Greater Concord Chamber of Commerce, and Red River Theatres. Most shifts are 4 hours long (there are a few shorter ones) and will involve a combination of the jobs below. Greeters: Greet guests in the various locations and help them find entrances, bathrooms, etc. Plan to bring your own snacks/lunch/drinks as necessary. You may be able to share some of the conference food but we won’t know for sure until we’re there. Free admissions to sessions when duties permit, and some access to the snack buffets in the exhibit area. Parking on Monday will probably be in the Capital Commons Garage off of Storrs St., we will provide more details as we get them. You may have to pay the $.50 per hour rate, we will let you know as soon as we know if there are other options available. Tuesday parking is plentiful and free at the Grappone Center. This event will be open first as a perk to our peer-award winners; that is GSA of the Year, Hospitality From the Heart, Service Award, and It’s Always Sunny Award from the past 6 years, and GSAs who volunteered last year. We may open the event to other GSAs if necessary, but maybe not. If you want to volunteer and are not on the list to the right, e-mail Naomi. Plan to arrive about 15 minutes before your shift starts to get settled. GSA uniform: GSA shirt, khaki slacks/pants or skirt, and name tag. Wear comfortable shoes, and no purses or large bags please. If you need to bring a lunch bag we’ll find a place to stash it. Periods of standing and walking, up to 45 minutes at a time, with some opportunities to sit down between session changes. Contact Person for GSAs This opportunity is open to only GSA of Year; Hospitality from the Heart; Service; and It’s Always Sunny award winners from the past 5 years, and GSAs who did it in 2017. If there are still spots open a week prior, we may open it to other GSAs. If you want to volunteer and are not on the list below, e-mail Naomi.